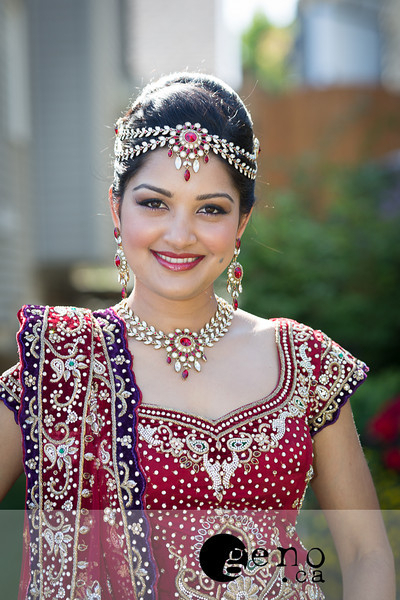 As with fashion, decor and music, makeup and hair is an element of an Indian wedding that is constantly evolving. Trends change and the colorful shadows and tight curls that were once popular aren’t the looks that brides are opting for today. 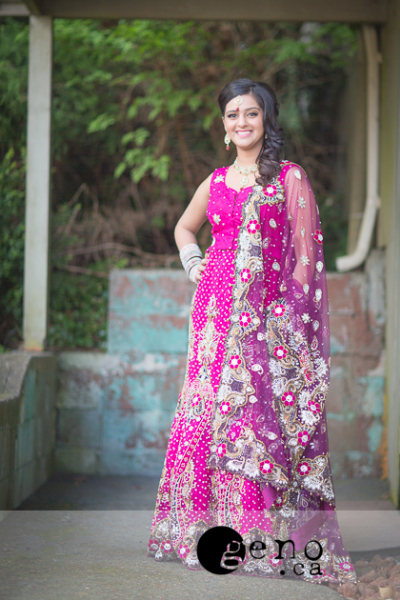 Yet in today’s world of contour and sparkly cut-creases it can be difficult to sort through the noise and decide on the looks you want for your pre-wedding events, wedding and reception. Working with a hair and makeup artist to plan your perfect looks should be seamless and exciting. Months of pre-planning your outfits and jewelry should come together as you sit with your hair and makeup artist to discuss your makeup and hair looks during your bridal consultation at which time you can talk about the looks you’re inspired by. Magazine spreads and Bollywood films can loan you plenty of visual inspiration. 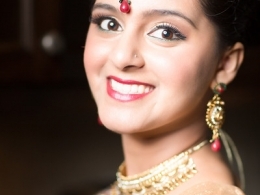 That was the case with our bride, Rokzanna, who was inspired by the simplicity and elegance of the hair, makeup and accessories from the Indian film Bajirao Mastani. 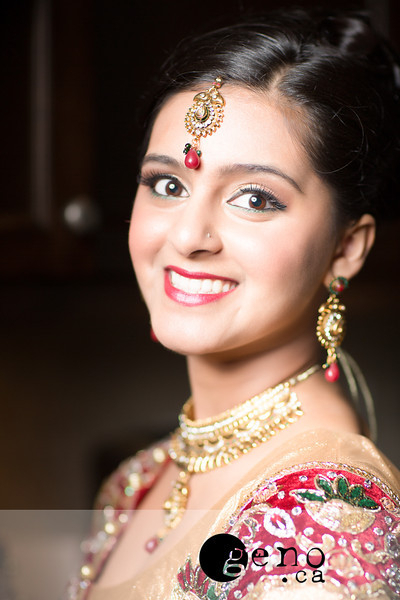 But as we all know, not everything goes as planned during a big Indian wedding and our beautiful bride was no exception. Weeks before her wedding, after her initial consultation, her grandmother fell ill and to honor her Rokzanna decided to wear the 24K gold sets that her grandmother and mother-in-law gave her. Opting to wear real gold vs the artificial sets originally selected for her looks was a bit of a curveball, but manageable and played well to the looks that Rokzanna envisioned for her events. For her engagement, Rokzanna wanted a playful look that is wearable. She decided against the heavy lashes as she didn’t want to look weighed down in the eyes. We created a look keeping current makeup and hair fads in mind, bringing out the hues of the accents in her outfit and accessories into her eye makeup. We mixed and matched her jewelry to give her a unique look, improvising by using a stunning pink stone earring as her tikka. The morning of the wedding, the entire makeup and hair application changed with the introduction of real gold. I changed the gold shadows we were planning on using and added gold to highlight to complement the gold set. Rokzanna wanted a clean, pulled back that showed her as her natural self, and not an overdone version of herself for her wedding day. We created a low full bun for light dupatta, and added some light pops of color to her eyeshadow by bringing out some of the colors from her outfit. When you’re wearing real gold it makes it the look more royal and powerful, with an ode to Indian retro combined with today’s trends. 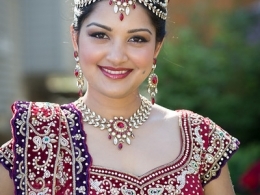 Wearing 24k gold on your wedding day is stunning if your top doesn’t have too much embellishment. We mixed and matched Rokzanna’s sets to give her a wedding look that wasn’t overly editorial. 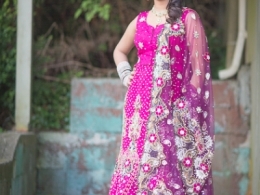 Wearing a dupatta on your head is generally something more common during the wedding ceremony, however we wanted to create a look for Rokzanna’s reception that could be worn both ways: with a dupatta swinging to the side, and on her head. We created two looks, one with a low bun and her gold jewelry around her neck – this look was created to allow her to wear her dupatta temporarily. We then transitioned this look into one where her hair was down and waved, with her jewelry now in her hair and not around her neck. Her lashes were still kept light as per preference, but now deeply smoked with brown pigment.